Screenshot of the website, showing different themes. Google Arts & Culture (formerly Google Art Project) is an online platform through which the public can access high-resolution images of artworks housed in the initiative's partner museums. The project was launched on 1 February 2011 by Google through its Google Cultural Institute, in cooperation with 17 international museums, including the Tate Gallery, London; the Metropolitan Museum of Art, New York City; and the Uffizi, Florence. The digital platform utilizes high-resolution image technology and enables users to virtually tour partner museums’ galleries, explore physical and contextual information about artworks, and compile their own virtual collection. The "walk-through" feature of the project uses Google's Street View technology, and partner museums could select one artwork to be captured as a gigapixel image (with over 1 billion pixels). On April 3, 2012, Google announced a major expansion to the platform as it signed partnership agreements with 151 museums from 40 countries. The platform now features more than 32,000 artworks from 46 museums, and image acquisition is underway at the remaining partner museums. This expansion includes works from institutions like the Art Gallery of Ontario, the White House, the Australian Rock Art Gallery at Griffith University, the Museum of Islamic Art, Doha, and the Hong Kong Museum of Art. Google also launched a second version of the website with new Google+ features, enhanced search capabilities, and a series of educational tools. The platform is now available in 18 languages, including English, Japanese, Indonesian, French, Italian, Polish, and Portuguese. Through the Virtual Gallery Tour (aka Gallery View) Users can virtually ‘walk through’ the galleries of each partner museum, using the same controls as Google Street View or by clicking on the gallery’s floorplan. From the Gallery View (aka Microscope View), users can zoom in on a particular artwork to view the picture in greater detail. As of April 2012, over 32,000 high-quality images are available for view. Microscope view provides users a dynamic image of an artwork, and scholarly and contextual information to enhance their understanding of the work. When examining an artwork, users may also access information detailing the physical characteristics of the image (e.g. size, material(s), artist). Partner museums were offered the option to include Viewing Notes, History of the Artwork, and Artist Information, which users can easily access from the microscope view interface. Each museum was allowed to include as much material as they wanted to contribute, so the level of information varies by museum and by artwork. Using services like Google Scholar and YouTube, Google includes external links for users to explore additional information about an artwork or gallery. Users can log in with their Google Account to create their own collection. Users can compile any number of images from any of the partner museums and save specific views of artworks to create a personalized virtual exhibition. Using Google’s link abbreviator (Goo.gl), users can easily share their artwork collection with others through social media and conventional online communications mechanisms. This feature was so successful upon the platform’s launch, that Google had to dedicate additional servers to support it. The second generation platform seamlessly integrates Google's social media platform Google+, so that site users can upload video and audio content to personalize their gallery, and share their collections through their social media networks. In the second launch of the platform, Google updated the platform's search capabilities, so that users could more easily and intuitively find artworks. Now, users can find art by filtering their search with several categories, including: artist, museum, type of work, date, and country. The search results are displayed in a slideshow format. This new functionality enables site users to search across numerous collections to find artworks that fit their parameters of interest. Several partner museums have opted to include guided tour or welcome videos of their galleries. This provides users the option to virtually walk through a museum themselves and listen to an audio guide at certain artworks, or to follow a video tour as an expert guides them through a gallery. For example, Michelle Obama filmed a welcome video for the White House gallery page, and Israel's Holocaust Museum Yad Vashem launched a YouTube channel with 400 hours of original video footage from the trial of Adolf Eichmann, which users can access through the museum's Arts & Culture exhibits. Google Arts & Culture includes several educational tools and resources for teachers and students. There are educational videos, available through a YouTube channel and embedded on the Google Arts & Culture web page. Next, two pages called "Look Like an Expert" and "DIY" provides several activities for site users, similar to those often found in art galleries. For example, one quiz asks site visitors to match a painting to a particular style; another asks visitors to find a symbol within a specified painting that represents a provided story. Finally, the "What's Next" page provides site visitors with a list of resources and links to various art history timelines, art toolkits, and comparative teaching resources. Google Arts & Culture includes the ability to find your fine art likeness just by snapping a selfie. You simply take a selfie in the app and it matches your face to old art museum portraits from their database. The feature went viral in January 2018. The feature was initially created by Cyril Diagne. The Google Street View Camera captures 360 degree images as it moves through the location. Usually, the camera sits atop a car to capture Street View images, but the platform camera was installed on an indoor trolley. The platform emerged as a result of Google's "20-percent time" policy, by which employees are encouraged to spend 20% of their time working on an innovative project of interest. A small team of employees created the concept for the platform after a discussion on how to use the firm's technology to make museum’ artwork more accessible. The platform concept fits the firm's mission "to organize the world’s information and make it universally accessible and useful." Accordingly, in mid-2009, Google executives agreed to support the project, and they engaged online curators of numerous museums to commit to the initiative. The team leveraged existing technologies, including Google Street View and Picasa, and built new tools specifically for the platform. They created an indoor-version of the Google Street View 360-degree camera system to capture gallery images by pushing the camera 'trolley' through a museum. It also used professional panoramic heads Clauss Rodeon VR Head Hd And Clauss VR Head ST to take high resolution photos of the artworks within a gallery .This technology allowed th excellent attention to detail and the highest image resolution. Each partner museum selected one artwork to be captured at ultra-high resolution with approximately 1,000 times more detail than the average digital camera. The largest image, Alexander Andreyevich Ivanov's The Apparition of Christ to the People, is over 12 gigapixels. To maximize image quality, the team coordinated with partner museums’ lighting technicians and photography teams. For example, at the Tate Britain, they collaborated to capture a gigapixel image of No Woman No Cry in both natural light and in the dark. The Tate suggested this method to capture the painting's hidden phosphorescent image, which glows in the dark. The Google camera team had to adapt their method, and keep the camera shutter open for 8 seconds in the dark to capture a distinct enough image. Now, unlike at the Tate, from the site one can view the painting in both light settings. Once the images were captured, the team used Google Street View software and GPS data to seamlessly stitch the images and connect them to museum floor plans. Each image was mapped according to longitude and latitude, so that users can seamlessly transition to it from Google Maps, looking inside the partner museums’ galleries. Street View was also integrated with Picasa, for seamless transition from gallery view to microscope view. The user interface lets site visitors virtually ‘walk through’ galleries with Google Street View, and look at artworks with Picasa, which provides the microscope view to zoom in to images for greater detail than is visible to the naked eye. Additionally, the microscope view of artworks incorporates other resources—including Google Scholar, Google Docs and YouTube—so users can link to external content to learn more about the work. Finally, the platform incorporates Google's URL shortener (Goo.gl), so that users can save and easily share their personal collections. The platform has been integrated with the social media platform Google+ to enable users to share their personal collections with their networks. This integration also lets site visitors use Google+ Hangouts for more interactive purposes. These situations might include: a professor giving an online lecture to students, engaging in video and shared-screen discussions about a collection, or an expert leading a virtual tour of a distant museum to remote attendees. The resulting platform is a Java-based Google App Engine Web application, which exists on Google's infrastructure. Luc Vincent, director of engineering at Google and head of the team responsible for Street View for the platform, stated concern over the quality of panorama cameras his team used to capture gallery and artwork images. In particular, he believes that improved aperture control would enable more consistent quality of gallery images. Some artworks were particularly difficult to capture and re-present accurately as virtual, two-dimensional images. 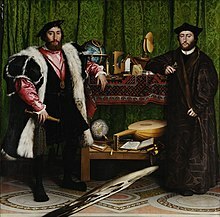 For example, Google described the inclusion of Hans Holbein the Younger's The Ambassadors as "tough". This was due to the anamorphic techniques distorting the image of a skull in the foreground of the painting. When looking at the original painting at the National Gallery in London, the depiction of the skull appears distorted until the viewer physically steps to the side of the painting. Once the viewer is looking at the shape from the intended vantage point, the lifelike depiction of the skull materializes. The effect is still apparent in the gigapixel version of the painting, but was less pronounced in the "walk-through" function. As New York Times art reviewer Roberta Smith said: “[Google Arts & Culture] is very much a work in progress, full of bugs and information gaps, and sometimes blurry, careering virtual tours.” Though the second generation platform solved some technological issues, the firm plans to continue developing additional enhancements for the site. Future improvements currently under consideration include: upgrading panorama cameras, more detailed web metrics, and improved searchability through metatagging and user-generated metatagging. The firm is also considering the addition of an experimental page to the platform, to highlight emerging technologies that artists are using to showcase their works. Seventeen partner museums were included in the launch of the project. The original 1,061 high-resolution images (by 486 different artists) are shown in 385 virtual gallery rooms, with 6,000 Street View–style panoramas. On April 3, 2012, Google announced the expansion of the platform to include 151 museums. At the time of the announcement, 46 of those museums and their works are available on the website. Like the original 17 partners, each of the new partners has a gigapixel image of one of their works on the platform platform. Google has been dedicated to making the platform a more global project, so it sought to expand its partnerships with local, regional and national museums from 40 countries. the platform now also offers galleries the option to submit a form and apply for partnership with Google. As early as the late-1980s, art museum personnel began to consider how they could exploit the Internet to achieve their institutions' missions through online platforms. For example, in 1994 Elizabeth Broun, Director of the Smithsonian American Art Museum, spoke to the Smithsonian Commission on the future of art, stating: "We need to put our institutional energy behind the idea of getting the Smithsonian hooked up to the people and schools of America." She then outlined the museum's objective to conserve, protect, present, and interpret exhibits, explaining how electronic media could help achieve these goals. The expansion of internet programs and resources has shaped the development of the platform. The Toledo Museum of Art worked with Google to remove 21 artworks from their virtual exhibition because the artists (or their heirs) still hold the copyright to the images. Another Google initiative—Google Books—affected the development of the platform from a non-technological perspective. Google recently faced a six-year-long court case relating to several issues with copyright infringement. Google Books catalogued full digital copies of texts, including those still protected by copyright, though Google claimed it was permissible under the fair use clause. Google ended up paying $125 million to copyright-holders of the protected books, though the settlement agreement was modified and debated several times before it was ultimately rejected by federal courts. In his decision, Judge Denny Chin stated the settlement agreement would "give Google a significant advantage over competitors, rewarding it for engaging in wholesale copying of copyrighted works without permission," and could lead to antitrust issues. Judge Chin said in future open-access initiatives, Google should use an "opt-in" method, rather than providing copyright owners the option to "opt out" of an arrangement. The high resolution imagery of artworks featured on the platform site are owned by the museums, and these images may be subject to copyright laws around the world. The Street View imagery is owned by Google. All of the imagery on this site is provided for the sole purpose of enabling you to use and enjoy the benefit of the platform site, in the manner permitted by Google’s Terms of Service . The normal Google Terms of Service apply to your use of the entire site. The Google team was sensitive to copyright issues of artworks, and partner museum staff were able to ask Google to blur out the images of certain works, which are still protected by copyrights. In a few cases, museums wanted to include artworks by modern and contemporary artists, many of whom still hold the copyright to their work. For example, the Tate Britain approached Chris Ofili to get his permission to capture and reproduce his works on the platform. However, since the project expanded in April 2012, Google has faced a few intellectual property issues. Some of the works added to the online exhibitions are still protected by copyright, as the artist or his or her heirs holds the right to the image for 70 years. As a result, the Toledo Museum of Art asked Google to remove 21 artworks from the website, including works by Henri Matisse and other modern artists. By December 2013[update], the contents of the project were accessible from Google Cultural Institute, a site that works similarly. It features digitized objects from archives, libraries and a wider array of museums not strictly devoted to art. This initiative is increasingly subsuming the Google Arts & Culture within its wider ambit. The Google Arts & Culture stirred up debate among scholars, museum personnel, art critics, and news writers. Since its initial launch, it has received fairly consistent positive feedback, and a variety of criticisms. With the second generation platform, Google appears to have responded to some earlier criticisms. Positive feedback about the platform has centered on an increased audience gaining access to art, the marketing externality for museums, and the potential for future development of the initiative. Increases access to art. So long as one has internet access, anyone, anywhere, at any time can visit the Google Arts & Culture, enabling audiences who otherwise would be unlikely to visit these museums to see their works. "Armchair tourists" are now able to tour some of the world's greatest art exhibits without leaving their seat. Professors and students can go on virtual field trips without the usual associated costs, and have a remote conversation with an expert from a museum or other institution. Better visitor experience. Users of the site can avoid constraints of time, money and physical difficulty. They need not plan a restrictive one-time visit to a collection, or arrive find out a work is not on view. They are not bothered by other visitors. Triggers new visitors Many art historians and scholars have posited that online exhibitions would drive more people to the gallery, and the Google Arts & Culture has supported this theory. Research established that there is a statistically significant relationship between those who visit the platform and those who are inspired to go on a real tour of a museum. In further support of this concept, within two weeks of the launch of the platform, MoMA saw its website's traffic increase by about 7%. It is, however, unclear how many physical visitors came to MoMA as a result of the platform. Complements real visits to a gallery. While there has been some skepticism that the Google Arts & Culture seeks to replace real-time visits to art galleries, many have suggested that the virtual tours actually complement real-time visits. Research shows that people are more likely to enjoy their real-time visit to a museum after participating in a virtual tour. Several museum personnel have supported this concept anecdotally. Julian Raby, director of the Freer Gallery of Art stated: “The gigapixel experience brings us very close to the essence of the artist through detail that simply can’t be seen in the gallery itself. Far from eliminating the necessity of seeing artworks in person, [Arts & Culture] deepens our desire to go in search of the real thing.” This view was shared by Brian Kennedy, director of the Toledo Museum of Art, who believed that academics would still want to view artwork in three dimensions, even if the gigapixel images provided better clarity than viewing the artwork in the gallery. Similarly, Amit Sood—the Google project leader—said that "nothing beats the first-person experience". Has future development potential. Some scholars and art critics believe the Google Arts & Culture will change how museums use the web. For instance, Nancy Proctor—Head of Mobile Strategy & Initiatives at the Smithsonian—suggested that museums may eventually utilize the platform to provide museum maps and gallery information instead of printed materials. It might become possible for museum visitors to hold up their smart phone in front of an artwork, and the platform could overlay information. the platform could also provide a seamless transition from a Google Map to an inside gallery map, avoiding the need for printed collateral. Democratization of culture. With the rapid increase of information that is available online, we are in a period of democratization of knowledge. An elite group of professionals and experts are no longer the only people with the ability to distribute respected information. Rather, through web-based initiatives like Wikipedia, anyone with web access can contribute to and help shape public knowledge. The Google Arts & Culture is, according to some, a democratic initiative. It aims to give more people access to art by removing barriers like cost and location. Some art or cultural exhibits have been limited to a small group of viewers (e.g. PhD students, academic researchers) due to deteriorating condition of a work, lack of available wall space in a museum, or other similar factors. Digitized reproductions, however, can be accessible to anyone from any location. This type of online resource can transform research and academia by opening access to previously exclusive art works, enabling multidisciplinary and multi-institutional learning. It provides people the opportunity to experience art individually, and a platform to become involved in conversation. For example, the platform now lets users contribute their own content, adding their insight to the public collection of knowledge. Many scholars have argued that we are experiencing a breakdown of the canon of high art, and the Google Arts & Culture is beginning to reflect this. When it just included the Grand Masters of Western Art, the project faced strong criticism. As a result of this outburst, the website now includes some indigenous and graffiti artworks. This platform also provides a new context through which people encounter art, ultimately reflecting this shift away from the canon of high art. A few initial criticisms of the platform—including skewed representation of artworksˇhave lost some validity with the launch of the second generation platform. Eurocentrism: During its initial launch, many critics argued that the Google Arts & Culture provided a Western-biased representation of art. Most museums included in the first phase of the Project were from Western Europe, Washington, DC, and New York, NY. According to Diana Skaar, head of partnerships for the platform, Google responded: “After the launch of round one, we got an overwhelming response from museums worldwide. So for round two, we really wanted to balance regional museums with those that are more nationally or globally recognized.” Now, the platform's expanded repository includes graffiti works, dot paintings, rock art and indigenous artworks. Selection of content: Although the Google Arts & Culture is now partners with 134 new museums, some critics believe it still may present a skewed representation of art and art history. Google and the partner museums are able to decide what information to include, and what artworks they will make available (and at what level of quality); some believe this is counter-intuitive to the website's seemingly democratic objective. For example, in the White House virtual collection, one photo of a former First Lady does not include a key piece of information to understand the context of the image. Grace Coolidge often wore brightly colored clothes. In her White House portrait, she was dressed in a red sleeveless flapper dress, and stood next to a large white dog. There are two versions of this picture: one showing Coolidge on a white background with softer lines, and one showing her on the White House lawn. The Google Arts & Culture description leaves out the reason for why there are two images. President Coolidge preferred his wife to a white dress. The artist, however, wanted the dress to contrast with the white dog. So, the President Coolidge then retorted, "Dye the dog!" While perhaps not crucial to understanding the exhibit, this and other examples show that the Google Arts & Culture and partner museums are in a position of power to curate the content and educational information of the virtual exhibition. Audience: Some critics have expressed concern over the intended audience of the platform, as this should shape the type of content available through the platform. For example, Director of the Center for the Future of Museums, Elizabeth Merritt, described the project as an "interesting experiment" but was skeptical as to its intended audience. Possible security risks: Some critics have raised the question of how Arts & Culture visitors might maliciously use the Street View images. For example, by providing highly detailed images of galleries, people could use this platform to map out museum security systems, and then be able to circumvent these protective measures during a break-in. Banner for Wiki Loves Art Nouveau Exhibition on Europeana. Europeana is a virtual repository of artworks, literature, cultural objects, relics, and musical recordings/writings from over 2000 European institutions. Images for the Future is a project dedicated to digitizing audiovisual cultural objects of the Netherlands, and making these exhibits available through its online archive. Khan Academy's smARThistory is a multimedia resource with videos, audio guides, mobile applications and commentary from art historians. The Bucharest Natural History Museum and the Museum of the Romanian Peasant offer virtual tours of two of Romania's larger historical/anthropological museums. The Prado launched a virtual collection, in collaboration with Google Earth, in January 2009. The website contained photos of 14 Prado paintings, each with up to 14 gigapixels. The Public Catalogue Foundation has digitised all the circa 210,000 oil paintings in public ownership in the United Kingdom, and made the paintings viewable by the public through a series of affordable catalogues and, in partnership with the BBC, the "Your Paintings" website. Works by some 40,000 painters are included. Some museums have collections that exist solely in cyberspace; these are known as virtual museums. The Virtual Museum of Canada is a virtual collection containing exhibits from thousand of Canadian local, provincial and national museums. Theosianama.com is an online knowledge-base on the Indian Arts, Books, Architecture, Culture and the worlds of Cinema. Tripbru is a digital tourism platform for Museums, Cities and Cultural Centers with particular focus on expert collaborators providing premium content. Wikipedia GLAM ("galleries, libraries, archives, and museums", also including botanic and zoological gardens) helps cultural institutions share their resources with the world through collaborative projects with experienced Wikipedia editors. ^ Waters, Florence (1 February 2011). "The best online culture archives". The Telegraph. Retrieved 2 February 2011. ^ a b c d e f Kennicott, Philip (1 February 2011). "National Treasures: Google Art Project unlocks riches of world's galleries". The Washington Post. Retrieved 2 February 2011. ^ Ngak, Chenda. "Google Art Project features White House, the Met, National Gallery". CBS News. Retrieved April 15, 2012. ^ a b c Valvo, Michael. "Google Goes Global with Expanded Art Project" (Press release). Google Art Project. Retrieved 6 April 2012. ^ a b c Finkel, Jori (2 April 2012). "LACMA, Getty among 134 museums joining Google's art site". LA Times. Retrieved 6 April 2012. ^ a b c d e Pack, Thomas (May 2011). "The Google Art Project is a Sight to Behold". Information Today. Vol. 28 no. 5. ^ a b c d e Proctor, Nancy (April 2011). "The Google Art Project: A new Generation of Museums on the Web?". Curator: The Museum Journal. 52 (2). ^ a b c Stanislawski, Piotr (3 April 2012). "Polska Sztuka w Google Art Project". Gazeta. Retrieved 8 April 2012. ^ a b Keyes, Alexa (3 April 2012). "Google Art Project and White House Launch 360 Tour of 'People's House'". ABC News. Retrieved 6 April 2012. ^ Heller, Aron (3 April 2012). "Israel Museum showcased in Google Art Project". Gainesville Times/Associated Press. Retrieved 6 April 2012. ^ "Education". Google Art Project. Google. Retrieved 6 April 2012. ^ "Art Selfie". Google’s art app is now top of iOS and Android download charts. ^ "Art Selfie". Out How to Make People Care About Art. ^ "Art Selfie". Votre selfie est une œuvre d’art mais vous ne le savez pas encore. ^ Knowles, Jemillah. "Google's Art Project grows larger with 151 museums online across 140 countries". TNW Google Blog. The Next Web. Retrieved 6 April 2012. ^ a b Sood, Amit. "Explore museums and great works of art in the Google Art Project". Google Official Blog. Google. Retrieved 22 March 2012. ^ "About Google". Google. Retrieved 25 March 2012. ^ a b Berwick, Carly (April 2011). "Up Close and Personal with Google Art Project". Art in America. Vol. 99 no. 4. ^ a b Davis, James. "Google Art Project: Behind the Scenes". Tate Blogs. Tate Britain. Retrieved 24 March 2012. ^ a b c Mediati, Nick (April 2011). "An extension of Google Street View enables interactive, Web-based virtual museum tours". PC World. Vol. 29 no. 4. ^ a b "FAQs". Google Art Project. Google. Retrieved 10 April 2012. ^ "Google and museums around the world unveil Art Project" (Press release). Google Art Project. Retrieved 1 February 2011. ^ Proctor, N (2011). "The Google Art Project: A New Generation of Museums on the Web?". Curator: The Museum Journal. 54 (2): 215–221. doi:10.1111/j.2151-6952.2011.00083.x. ^ Efrati, Amir. "Judge Rejects Google Books Settlement". The Wall Street Journal. Retrieved 9 April 2012. ^ Cohen, Patricia (24 April 2012). "Art is Long; Copyrights Can Be Even Longer". The New York Times. Retrieved 26 April 2012. ^ Ionescu, Daniel. "Google's Art Project Extended Worldwide". PC World Blogs. PC World. Archived from the original on 2013-11-04. Retrieved 6 April 2012. ^ a b Bararia, Khushboo. "Promotion of Virtual Tourism through Google Art Projects". Masters Thesis. Christ University. Retrieved 6 April 2012. ^ Sood, Amit. "Amit Sood: Technologist". Speakers. TED. Retrieved 24 March 2012. ^ Sanger, Larry. "Who Says We Know: On the New Politics of Knowledge". Edge: The Third Culture. Retrieved 26 April 2012. ^ Inanoglu, Zeynep. "Google Art Project: Democratizing Art" (PDF). Retrieved 8 April 2012. ^ Guerlac, Suzanne (Fall 2011). "Humanities 2.0: E-Learning in the Digital World". Representations. The Humanities and the Crisis of the Public University. 116 (1): 102–127. doi:10.1525/rep.2011.116.1.102. ^ Anonymous (3 February 2011). "Getting in close and impersonal". The Economist. Retrieved 6 April 2012. ^ Hayward, Andrea (4 April 2012). "ARTS: Global artworks now a click away". Australian Associated Press Pty Limited. Retrieved 6 April 2012. ^ a b Sooke, Alistair (1 February 2011). "The Problem With Google's Art Project". The Telegraph. Retrieved 6 April 2012. ^ Nonnenmacher, Peter (8 February 2011). "Virtuelle Tiefenschärfe". Wiener Zeitung. Retrieved 6 April 2012. ^ Andy MacLean. "Wiki Loves Art Nouveau". europeana.eu. ^ McKenn, Brian (April 2011). "Europeana Stretches as Google Expands". Information Today. Vol. 28 no. 4. pp. 14–15. Retrieved 2012-05-15. ^ a b "Images for the Future". Imagesforthefuture.com. Retrieved 2012-04-19. ^ Ovidiu Sopa @ office@sibiul.ro. "Muzeul National de Istorie Naturala Grigore Antipa #48". Antipa.ro. Retrieved 2012-04-19. ^ "Tur Virtual – Muzeul Taranului Roman". Tour.muzeultaranuluiroman.ro. Retrieved 2012-04-19. ^ "Smart Digital Tourism Platform". "Google Art: See Paintings like never before", BananaBandy, 6 June 2016. Retrieved on 6 June 2016. Google (1 February 2011). "Google and Museums Around the World Unveil Art Project". London: Google, Inc. Retrieved 2 February 2011. Kennicott, Philip (1 February 2011). "National Treasures: Google Art Project Unlocks Riches of World's Galleries". The Washington Post. Retrieved 2 February 2011. "Google Art Project: The 7 Billion Pixel Masterpieces". The Daily Telegraph. London. 1 February 2011. Retrieved 2 February 2011. Tremlett, Giles (14 January 2009). "Online gallery zooms in on Prado's masterpieces (even the smutty bits)". The Guardian. London. Waters, Florence (1 February 2011). "The Best Online Culture Archives". The Daily Telegraph. London. Retrieved 2 February 2011. Wikimedia Commons has media related to Google Art Project.